3 Bedroom End of Terrace House For Sale in Christchurch for £355,000. LAST ONE REMAINING A brand new development of just three quality three bedroom homes designed and built in keeping with the surrounding character properties in the sought after Twynham school catchment area. These homes are available to purchase with just a 5% DEPOSIT with the Government Funded HELP TO BUY Scheme. Church Gardens is a quality development of one mid-terrace and two end terrace houses built to a high standard and specification to include underfloor heating, luxury kitchens with generous amounts of granite worktops and integrated appliances, ground floor cloakrooms, LED lighting, contemporary bathrooms, block paved driveways with off road parking and enclosed southerly rear gardens. 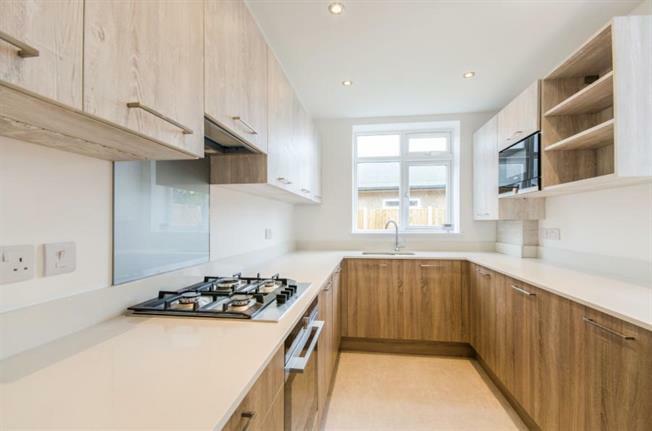 Fully fitted modern kitchen with white granite worktops and upstands and wood effect fronted units with soft close mechanism, matching internal shelving and fitted recycling bin unit. Built in electric oven and four ring gas hob with Smeg extractor unit. Stainless steel sink unit with Chrome swan neck mixer. LED recessed lighting and over counter lighting. Chrome mixer tap and shower attachment plus rain shower and screen. Full complimentary ceramic tiling to the walls and floor. Fitted demist and led mirror with touch control and vanity unit below. Gas central heating via two zone controlled under floor heating throughout the ground floor and radiators to the first floor - 5 year warranty for boiler. A hardwaring vinyl flooring throughout the ground floor to replicate the beauty of natural wooden planks. Quality fitted carpets with underlay to the stairs, landing and bedrooms. White internal doors with chrome door furniture. Upvc double glazed French doors to the rear paved patio. Rear gardens laid to lawn in addition to the patio and fully enclosed by 2 metre fencing. Block paved driveway with off road parking to the front. Television points to the living room and the master bedroom. Cloakroom designed for wheelchair access plus fitted cabinet. Uprated security windows with laminate glass and uprated locking mechanism. Upvc double glazed throughout plus a high quality composit front door.